"Last.fm Scrobbler" was created for people who listen to music online through their browser, and would like to keep an updated playback history using Last.fm's scrobbling service. You should authorize with Last.fm by clicking on a notification which is displayed when the extension is firstly installed. The scrobbler status is shown on the right side of the address bar. 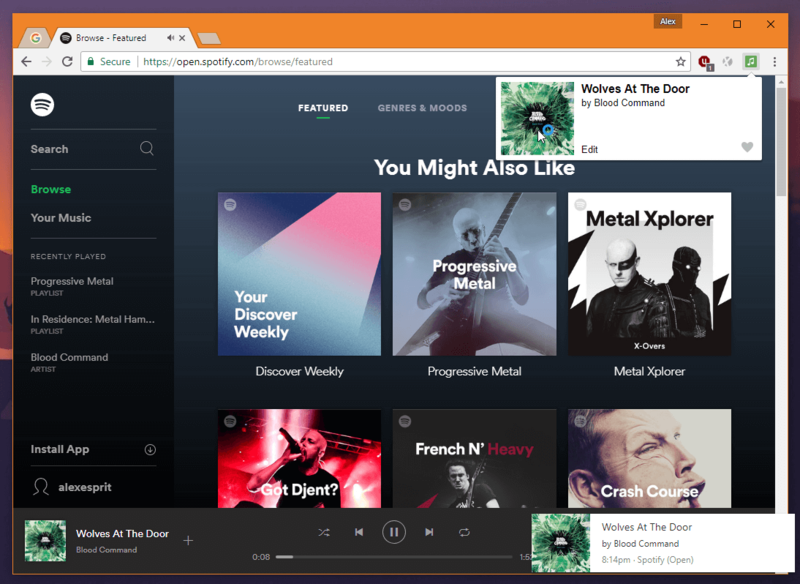 Optionally you can enable desktop notifications of now playing songs. You can manually correct the song title by clicking on the scrobbler icon, if the song doesn't get recognized. You can also edit now playing song using "Edit" link in the info popup. How can I start using the extension? Note: In some cases, the notification won't be shown, e.g. on Mac OS if Chrome is running in full-screen mode; the extension will open a tab where you can grant access to your account. How do I temporarily disable scrobbling? You can do that by right-clicking on the extension icon in the extension bar. Using the context menu you can disable the connector for current web service. Use the checkboxes on the options page to disable certain connector, or the "Toogle" checkbox to disable scrobbling globally. How can I disable the now playing notifications? Now playing notifications are enabled by default, but you can disable them on the options page. The song was not recognized! Can you fix it? When a song cannot be recognized, a gray icon with question mark appears in the extension bar. You can click on this icon and input correct data in the opened popup window. The data you input is stored for certain connectors which support this feature. Also, there's an option called "Force song recognition" that makes the extension to force scrobbling the song even if song is not validated by Last.fm. Where I can find the change-log of new versions? The change-log is available at https://github.com/david-sabata/web-scrobbler/releases. Some musics on Bandcamp cannot be scrobbled. Is it possible to fix this? Looks like the music is hosted on a custom domain and we cannot detect whether it’s Bandcamp or not. Add URL pattern that matches the Bandcamp custom domain URL and apply the changes.